Stepney had a number of early workhouses at hamlets within its parish boundaries. These included Mile End Old Town, Limehouse, Wapping, and Ratcliff. An Account of Several Workhouses for Employing an Maintaining the Poor, provides the following account of the Mile End Old Town parish workhouse, dated June 1729. HERE is a very commodious Brick-House, built 25 years since, for lodging the Poor of this Hamlet, but was not applied to the present Use, till after the Act of the 9th of King	GEORGE was passed, to encourage the setting up Workhouses ; when, by a Subscription among the principal Inhabitants, it was fitted up to receive the Poor, and was opened April 28, 1724. THE Number of Poor now in it is about 30, most of whom are unfit for Labour, but about a Dozen of them are employed in picking Ockam, at which they earn about	4 or 5 Shillings a Week in the whole, which is applied toward the Maintenance of the House. THE Steward of the House is a Pensioner of the Hamlet, and is allowed 5l. 4 s. Per Annum, beside his Maintenance and Lodging, &c, in the House. But the principal Care is in 8 Trustees and a Cashier, some of whom visit the House constantly once, sometimes twice a Week, buy Provisions, and give all other necessary Directions. As to Diet, they have Flesh four times a Week, and with it such Roots as are in Season; And the Steward having been a Sea-faring Person, feeds them after the Method used on Ship-board ; that is, by joining 4 of them in a Mess, and the Meat is boil'd in three Pound pieces, one of which is a Mess for 4 Persons ; and the same Course is observed for Milk, Bread, Beer, &c.
THE Children in this House are all young and helpless, and therefore are sent to a School in the Neighbourhood, at the publick Charge, till they are 8 Years of Age ; and then they are bound out Apprentices till the Age of 24, according to Act of Parliament. In 1814, the Parish of Saint Anne, Limehouse, obtained a parliamentary Act to allow it to rebuild its workhouse. The Account's report for Ratcliff (now Ratcliffe) was also dated June, 1725. THE Inhabitants of this Hamlet paying upwards of 70l. per Annum House-Rent for the Poor, resolved, about two Years hence, upon fitting up a large House in London-Street, belonging to the Hamlet, and now called the Town-House, for lodging all the Poor who received Pensions, and were before lodged at the publick Charge. THERE are now about 30 poor People, mostly Women, in the House, who are allowed each of them 12 d. a Week Pension, and the Liberty to get what they can by their own Industry, either at Home by Spinning, winding Silk, &c. or by going abroad to wash, scour, sell Fish, or do any thing else to get a Penny. And as for such Poor as will not be lodged in this House, a Deduction of 6 d. a Week is made from each of their Pensions, towards the Repairs, &c. of the House. THERE is a Mistress, and an Assistant or two, who take Care to keep the House clean, and are particularly charged to see the Poor all in Bed, and their Fires and Candles out, by 9 a Clock at Night, or soon after. The parish of St Paul, Shadwell, set up a workhouse in 1726. Around a hundred men, women and children were accommodated and employed in picking oakum. The Account's entry for Wapping was dated June, 1731. IN the Year 1723, the Vestry of this Hamlet empower'd the Churchwarden, with the six Overseers of the Poor, and 5 other Gentlemen to act as Trustees, for hiring a House fit for receiving and employing their Poor. Accordingly they took a large Warehouse in Virginia-Street, near Ratcliff-Highway, and fitted it up with convenient Rooms and Chimneys, and there are now in it about 60 Men, Women, and Children, wholly maintained, of which they that are able are employed chiefly in picking of Ockam, and doing the necessary Offices of the House, under the Direction of a Mistress. THEIR Bill of Fare is much the fame as in other Places, only they have 4 Flesh Days in the Week, viz. Sundays, Tuesdays, Thursdays, and Saturdays. In 1817, a local Act of parliament was passed "for raising Money, by Annuities or otherwise, for the Purpose of erecting a Workhouse for the Use of the Poor of the Parish of Saint John of Wapping". The workhouse was subsequently erected but clearly cost more than anticipated since a further Act was required two years later in order to raise further funds. Stepney Poor Law Union formally came into existence on 19th December 1836. Its operation was overseen by an elected Board of Guardians, 23 in number, representing its 5 constituent parishes as follows (figures in brackets indicate numbers of Guardians if more than one): Limehouse (5), Mile End Old Town (8), Ratcliff(e) (4), Shadwell (4), Wapping (2). The population falling within the new Union at the 1831 census had been 72,446 — ranging from Wapping (population 3,564) to Mile End Old Town (33,892). The average annual poor-rate expenditure for the period 1834-36 had been £27,300 or 7s.6d. per head of the population. In 1857, Mile End Old Town became a separate Poor Law 'Hamlet' and soon afterwards set up its own workhouse. The Stepney Union was known as the Parish of Limehouse for a short period from 1921-25. In 1925, the Hamlet of Mile End Old Town, the Parish of St George In The East, and the Whitechapel Union were added to the Stepney Union which was then renamed the Parish of Stepney Union in 1927. 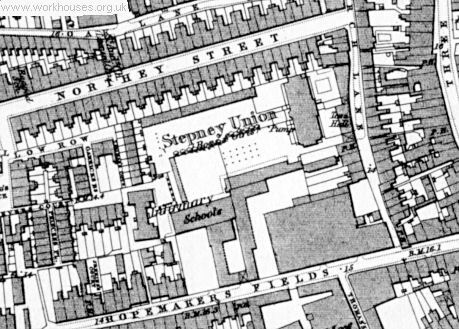 Between 1838 and 1857, Stepney Union continued to make use of the parish workhouse it had inherited from Mile End Old Town. It was located in Alderney Place, off Globe Road in Mile End, and provided accommodation for able-bodied men and fever patients. The original Stepney Union took over an existing workhouse at the south side of Green Bank in Wapping and used it to house female inmates. In January 1860, The Times reported that a Thames Police Court Magistrate had described the workhouse as 'a perfect bear-garden' and that 'a most disgraceful and painful state of things' existed there. Shortly afterwards, Charles Dickens paid an incognito visit to the establishment and provided his own description in an episode of his series ' The Uncommercial Traveller published in the magazine All The Year Round of which he was also the editor. The Wapping workhouse closed in 1863. Stepney also inherited an existing parish workhouse on Church Lane, Limehouse which it adapted for use as a residential schools establishment for children. 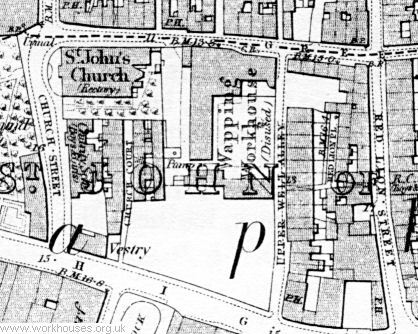 A map of around 1870, indentifies the school block and an infirmary. A description of the schools was provided by Florence Hill in her 1868 book Children of the State. As well as the usual school-instruction, the boys were taught shoemaking, tailoring, carpentering, and spinning; the girls learned laundry, housework, sewing and knitting. A full sized ship's masts and rigging were erected in the grounds with a seaman employed to drill and train the boys who were also taught to swim. All the children were taught singing, with a school choir attending the choral festivals at the Crystal Palace. A boys' military-style band was also established opening up the possibility of a career in the army or navy. The Limehouse school was also the subject of one of Charles Dickens' Uncommercial Traveller pieces. The article, The Short-Timers was published in the magazine All Year Round in June, 1863. The school closed in 1873 when Stepney became part of the South Metropolitan School District and sent its children to the district schools at Sutton. The site was later occupied by a brewery. The former Ratcliffe parish workhouse on York Street West (later 45A Barnes Street) in Ratcliffe became home to the Stepney Union's Guardians' Offices and casual wards. In around 1907, the casual wards were closed and a children's receiving home was set up on the site. In 1915, the Stepney Union was operating scattered homes at 14-17 Cottage Grove (now Rhondda Grove), Mile End Road. In 1861-3, a new Stepney Union workhouse was erected at the west side of St Leonard's Street, Bromley-by-Bow. Designed by Henry Jarvis of Trinity Square, Southwark, it cost over £30,000 and was intended to accommodate up to 800 inmates. The foundation stone was laid by James Charrington, Chairman of the Board of Guardians and prosperous local coal merchant, at a ceremony on October 18th, 1861. He recounted a history of the Stepney Union and children from the Limehouse institution sang Psalm 100. The building opened on March 30th 1863 and local ratepayers were invited to inspect the premises and its gas lighting. The three-storey main building was constructed of brick and had a T-shaped layout with its main facade facing to the south. At the centre were administrative office and the Master's accommodation, with male and female accommodation in wings at each side. A dining hall and chapel were to the rear. Stepney main building from the south-west, c.1938. 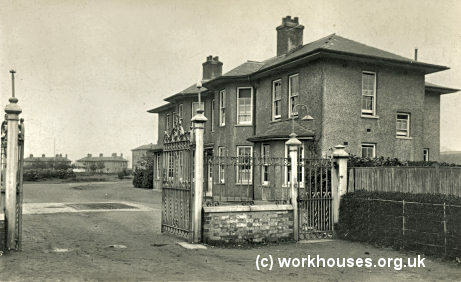 A separate hospital block was erected at the west of the workhouse. 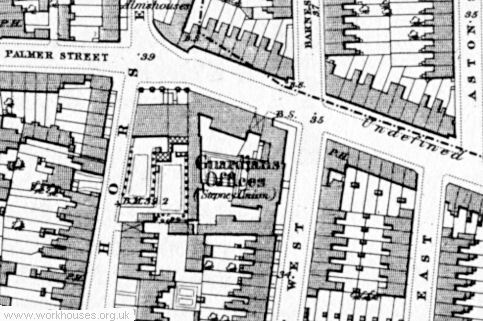 In 1904, to prevent them from disadvantage in later life, children born in the Bromley workhouse had the location recorded as 50A St Leonard's Street. Stepney was involved in several further reorganisations of poor law administrative areas. From 1921-5 it was known as the Parish of Limehouse, then from 1925 a new Stepney Union was set up comprising Mile End Old Town, St George in the East, and Whitechapel. In 1922, several hundred Stepney unemployed stormed the building to protest against the rates of outdoor relief in Stepney which were lower than those in the neighbouring Poplar Union. The buildings suffered bomb damage during the Second World War with the western part of the original building and an 1893 annexe being destroyed. After the war, Bromley House as it became known, was used to house homeless families. The premises were closed down in March 1966 and demolished the following month to make way for an elderly persons' home. In 1901, the Stepney Guardians erected a group of children's cottage homes on an 86-acre green-field site at Stifford in Essex. The scheme was designed by Frank Baggallay. The homes, which could accommodate 200 boys and girls, were arranged in a south-facing arc as shown on the 1920 map below. Stifford Homes entrance and lodge, date unknown. At the centre of the arc were a central water tower and workshops separating the boys' houses at the east and the girls' at the west. A T-shaped receiving block lay at the eastern entrance to the site and an infirmary at the far west. 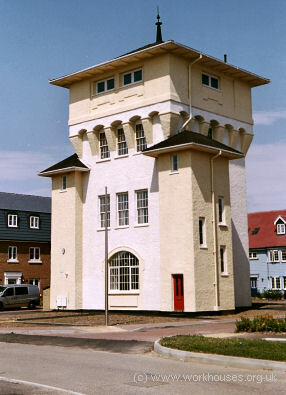 Stifford Homes water tower from the south-east, 2005. Stifford Homes boys' home, 2005. 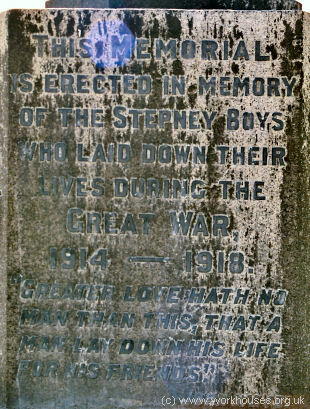 A memorial at the south of the houses records those who died in the First World War. 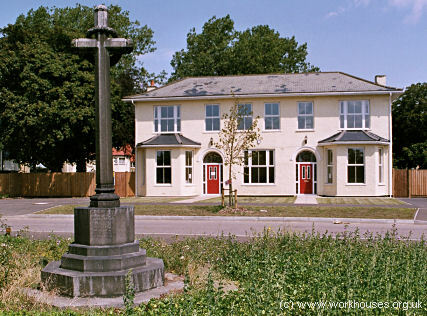 Stifford Homes war memorial, 2005. In 1930, the school was taken over by the London County Council and in 1935 became a boys' Approved School, also known as Ardale School. The majority of the school buildings have now been demolished and the site, now named Guardian Avenue, has been converted to residential use. By the early 1900s, Stepney operated a casual ward for vagrants at Eastfield Street (also referred to as 121 Maroon Street) in Limehouse. London Metropolitan Archives, 40 Northampton Road, London EC1R OHB. Union records include Guardians' minute books (1836-1926); Financial records 1839-1925; Staff records (1894-1925); etc. Wapping Workhouse — Admissions and discharges (1848-63). Limehouse Children's Establishment — Admissions and discharges (1838-73); Deaths (1866-73); Creed registers (1869-73); Visitors (1865-71). 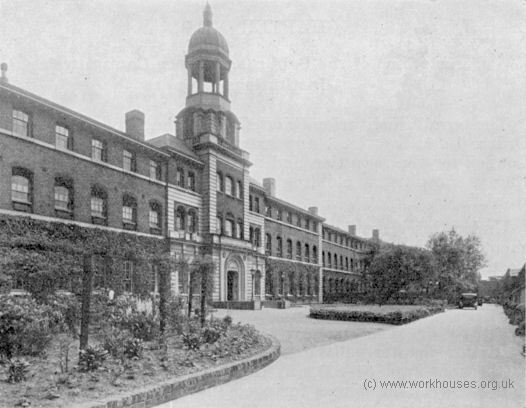 Ratcliffe Workhouse — Admissions and discharges (1839-72, 1893-1908). St Leonard's Street Workhouse — Admissions and discharges (1863-1913); Births (1866-1923); Deaths (1866-1923); Creed registers (1874-1923). Stifford Children's Homes — Admissions and discharges (1902-23); Creed registers (1902-21). Cox, Patrick G (2015) Limehouse Boys — historical fiction set in 1830s London in the East End featuring the Shadwell workhouse.